Local officials and other community members feel that the MTA hasn’t done enough to share a contingency plan for the impending L-pocalyspe. They rallied in Williamsburg on Tuesday to complain that transparency has fallen off with just 17 months to go before the L-train shutdown. City DOT commissioner Polly Trottenberg speaks with press. A group of city officials and local residents gathered today at the East Broadway subway station as part of a publicity tour calling attention to New York City’s deteriorating public transit system. Today is a sad day. Not because the long weekend has ended, which rightfully warrants a tear or two, but because the parking party is over in the East Village. If you’re one of the 23 percent of New Yorkers who own a car and happen to need a free parking spot in the East Village, you’re in luck. We’ve found the rarest of commodities: a stretch of curb that doesn’t have any parking regulations. Seriously. None. 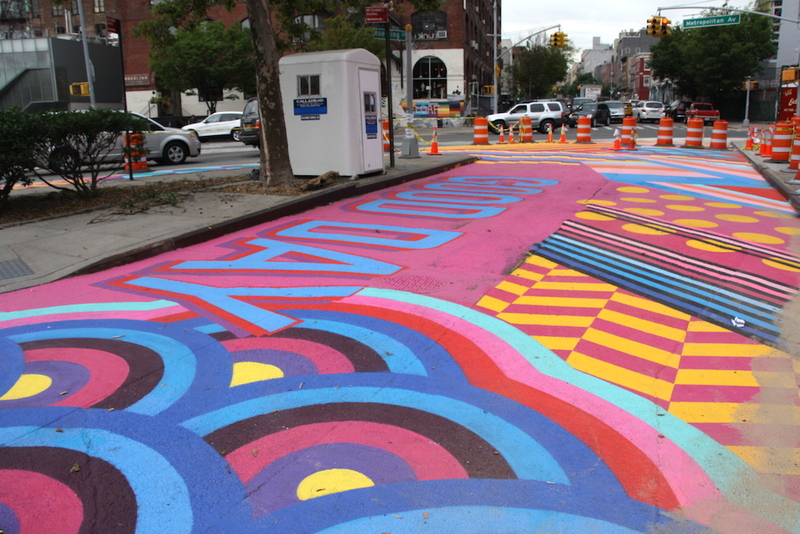 The Department of Transportation’s newest pet project has been the DOT Art Initiative, which partners with artists and community organizations to bring some color into this concrete jungle. You might have caught last month’s “asphalt activation” at a Citi Bike docking station in Williamsburg. Now, the DOT has partnered up with New York State Senator Daniel Squadron and the non-profit Hester Street Collaborative to set up a temporary public art installation on the South Street median, starting at Rutgers Street. Amidst all the pigeon poop, garbage juice, and sundry other mystery substances littering the streets of New York, there are actually some hard-working people out there trying to make this city just a teensiest bit nicer. Sure, you could go the ad-hoc route like this artist who leaves gold spray-painted trash bags lying around. Or, go the way of the city’s Department of Transportation and commission artists to unleash the pretty. Williamsburg is the new recipient of one such beautification project, with a massive painting adorning the ground of Ascenzi Square, in the triangle formed by Roebling Street, Metropolitan Avenue, and N 4th Street. The Department of Transportation thinks your graffiti is vulgar, and will power-wash it into oblivion until New York City is restored to the sparkling shiny gem it once was. At least, that seemed to be the general message at this morning’s press conference with DOT commissioner Polly Trottenberg, held under an overpass of the Manhattan Bridge in Chinatown. They don’t roll on Shabbos, or anytime else. But among the Hasidim of South Williamsburg, a grassroots organization is pushing for more bike-share stations. Hasidim For Bikes, founded late last month, is committed to uniting those members of the Hasidic community who are psyched for bikes — and bummed about a perceived dearth of bike stations south of Broadway.